In keeping with its neutral stance on Israel-Iran tensions, India has asked its Army Chief General VK Singh not to travel to Tel Aviv on a scheduled official visit next month. Public sector banking remained paralysed throughout the country while transport services were hit in most states as the nationwide 24-hour strike called by 11 major trade unions evoked a mixed response, while the Left trade unions led by CITU claimed success. The government partially succeeded in its attempt to bring to a happy end to the saga of the NRI children at the centre of a custody row in Norway when the Norwegian Child Welfare Service today decided to award their custody to their uncle. This would enable him to bring the children back to India. Virat Kohli blasted an unbeaten 133 as India snatched an incredible victory against Sri Lanka by chasing down a mammoth 321 in only 36.4 overs to rekindle their hopes of making it to the final of the tri-series, at Hobart on Tuesday. Khap leaders agitating for reservation under the OBC quota today announced that they would go for a �decisive battle� as talks between Haryana Chief Minister BS Hooda and representatives of leaders of Sarva Khap Jat Pratinidhi Panchayat broke down here tonight. At least four school children were killed and several others were missing when a bus carrying them fell into a canal in East Godavari district of Andhra Pradesh today. India and Italy today failed to resolve their differences over who should probe the killings of two Indian fishermen by Italian marines off the Kerala coast earlier this month. 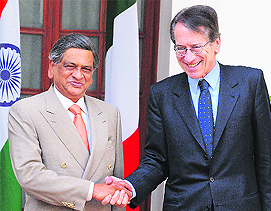 External Affairs Minister SM Krishna with his Italian counterpart Guilio Terzi in New Delhi on Tuesday.